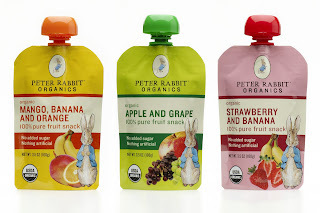 One of the most beloved characters from children’s literature, Peter Rabbit, is thumping his stamp of approval on a fresh, new way for kids and babies to eat healthfully: 100 percent organic fruit puree in a pouch. With no added sugar, preservatives or artificial ingredients, Peter Rabbit Organics fruit pouches come in three delicious, kid-friendly varieties: Apple and Grape, Strawberry and Banana, and Mango, Banana and Orange. The purees are already a hit in the U.K., where babies, toddlers and kids love the naturally sweet taste and the squishy, squeezy fun, and parents appreciate the mess-free, resealable pouches, and safe, anti-choke cap. "Our flavor names match our ingredients. What you see on the label is what’s inside," said Ben Ford of the UK-based PR Organics, which is introducing the convenient pouches. "While kids think they’re just brilliant, what’s really smart is how the pouches make eating healthy fruit a handy, on-the-go option. No more bruised bananas or searching for missing spoons – just good, squeezable fun." Adorned with the charming (and mischievous) Peter Rabbit character, each colorful pouch offers a full serving of fruit and a natural boost of Vitamin C and fiber. They require no refrigeration until opened and can be taken virtually anywhere – popped into lunchboxes, stashed in the stroller or tucked in the car for a quick, easy snack. The 3.5 oz. pouches are available at select Whole Foods Markets and independent natural food stores in a number of regions across the country this summer for an Suggested Retail Price of $1.79 each, and by the 10-pouch case on Amazon.com at www.peterrabbitorganics.com/usa/buy-our-pouches. First of all, let me tell you that I did not get to try any of these! By the time I went to the fridge to get one, they were GONE! Which to me, says they were GOOD! My daughter had two of them and my son had one. When I inquired as to whether they were good, I was told they were GREAT! As a great snack on the go, with no added sugar, or water, these are GREAT! I just wish I had gotten to try some... Greedy kids! LOL! At least they have some at my local David's Natural Market, which is shocking, but I can buy some there if I want some! Peter Rabbit Organics has generously offered to give some of these great snacks to three of my readers! Three winners will win 3 pouches each! Remember to stop by Moody Mama Says and Everyday Baby Steps to see what they have to giveaway today!